I grow hundreds of dollars worth of herbs, berries and vegetables in a typically-sized city yard. I use a technique called "permaculture" which essentially means I don't weed, I plant everything all mixed together, and generally mimic nature's wisdom. I spent a week compiling photos and footage going back as far as 2009 that show how my garden as developed. The big changes started in 2011. The video is 19 minutes long, but I've put some great music from Hang Massive on it, so you can sit back and relax. Hang Massive provides music download from their website based on donations. Please support the donation-based movement by donating what you can and enjoying the sound of giving. Want to grow your own permaculture paradise, travel during the cold season, work less, and live better? 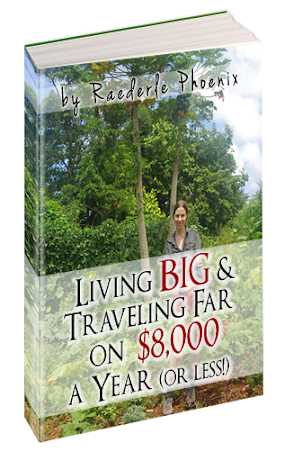 Then you'll love my book, Living Big & Traveling Far on $8,000 a Year (or Less!). Wonder how I afford my all-organic lifestyle full of traveling and fun? In my new book I explain how I do it all on only $8,000 per person, yearly. That's right — traveling six out of twelve months, all organic meals, lots of free time, and organic clothes too! I'm including every detail for how to do this in my book. I spend an average of 12 minutes a day in my garden. I know this average to be perfectly accurate for the time period of June 2012 through September 2014 because of my little daily practice that I call my "Activity Log." I wrote about this in a blog post called Spending Time Wisely, and I wrote about it extensively in my book, Living Big & Traveling Far on $8,000 a Year, because this practice has really helped me soar! Those little twelve minutes include planting, weeding, digging, composting, and harvesting. A couple weeks ago I brought in five little watermelons, a bowl full of tomatoes, and a heaping bowl of lemonbalm, mint, sage and basil. That was the first week of October. In September I administered a cleanse where I made daily juices from burdock roots, comfrey roots, dandelion roots, lamb's quarters, broad-leaf plantain, thyme and oregano. In July I feasted on blackberries and blueberries. In June there were currant berries and the herbs were really at their peak. I enjoyed sorrel on my salads daily. In May I had an average of five strawberries each day. You get the idea, right? This garden is a sanctuary of fresh air, beautiful green plants and organic food... Yet just 12 minutes a day is all it takes to create and maintain. Curious about growing your own permaculture garden? Start small, take some lovely photos and some time to smell the roses. Start with just a square foot or so. Let it be easy. Let it evolve in as little as 12 minutes a day (that is 1.4 hours per week or 6 hours per month). For more life-changing concepts and green ideas, sign up for my e-course below the comments.